Today, when you order "Hands-Off Multiple E.S.P. 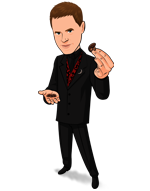 System (Download + 2 Decks) By Neil Tobin", you'll instantly be emailed a Penguin Magic gift certificate. You can spend it on anything you like at Penguin, just like cash. Just complete your order as normal, and within seconds you'll get an email with your gift certificate. Finally, E.S.P. cards that look so authentic, they make all your mentalism seem more real. Plus an original system of mentalism effects you can perform standing up and surrounded! That's what Neil Tobin brings you with HOME (Hands-Off Multiple E.S.P.). SAMPLE EFFECT: Take a pack of E.S.P. cards out of their box, leaving a folded business card inside. After showing the faces, give half the cards to each of two participants — and from this point on, NEVER TOUCH THE CARDS AGAIN. Direct the participants to cut their facedown packets over and over — and when they stop, explain you've been mentally influencing them all along. Want to prove it? Ask one of the participants to name a symbol: she names (for example) the star. Dump the folded business card out of the card box and unfold it: drawn in bold marker YOU PREDICTED THE STAR! Finally, invite both participants to turn up the top cards of the packets they still hold in their hands: BOTH CARDS SHOW STARS! In addition to letting you perform the powerful effects that make up the HOME system, these versatile decks can improve any E.S.P. effect you already perform. ESP cards are essential part of my show warm ups. Picked these up and must say that they are absolutely wonderful. I love the muted tones and grid backs. These definitely have a lab quality feel to them. I tried hard to spot the method before reading the instructions. Came close but couldn't nail the specifics - I'm absolutely confident a layperson would miss it entirely much less suspect they are even marked. The marks, once you know what to look for, are fairly easy to spot even for those of us who should be wearing glasses. Ordered a set & just recieved them. REALLY love these as they don't scream card trick. Actually very simple & "inoccent" looking backs, easily readable for us & normal enough looking not to raise suspicion by spectator. Yes lots of uses from Luna,WH, etc. other than the suggested routines & ideas that are included. These are perfect to start spectators off to see whom has potential & play into other effects. Thank you for putting these together & I love there are plenty backups in black & white sets. Awesome job on these Neil !! I hate giving reviews but this E.S.P. System is worth one. These cards are well worth the money. Once you understand the layout you have a lot going for you. In other words even though you're looking at the back the information given would be like looking at the front. Okay so what effects you can you do with them? Everything. The only thing that will hold you back would be you're own mind. You could use this deck on so many levels like any marked deck. A magician friend who also purchased this E.S.P System because they were after the old looking back design to fit their patter took the advise contained in the instructions to age the deck even more. It looks great. I witnessed one of his performances and everyone bought into his patter. Ha, laymen you just have to love them. After seeing their reaction I was ready to sell them a certain bridge in New York. There are many excellent ESP decks out there, but this particular deck is one of the best. The markings are easy to read, and yet subtle enough to pass cursory examination. The best part is the inclusion of a set of colored symbols, which increases its versatility for novel routines. Most ESP routines just have a 1 in 5 chance of matching, but with the addition of colors, the odds rise to 1 in 25. Plus, there's the inclusion of gaffed cards that allow for some sneaky routines. The symbol design is crisp and while not exactly like the original Zener cards, easy to distinguish. The colored deck is in muted tones, which conveys the idea that these are used for actual experiments, and makes them easy to read no matter the lighting conditions. Definitely a must-have for the paranormal performer. What a GREAT tool for the mentalist. Finally, "real" ESP cards. Well they look real, that it. And marked so I can see with poor eyesight too! Love these cards! Highly recommended. These arrived this morning and I am pleased with them, awesome looking cards, well made and without the backs other cards have that make them look "playing card like". I broke out the old typewriter and made a label for the tuck box. Highly recommend these if you're looking for esp cards. 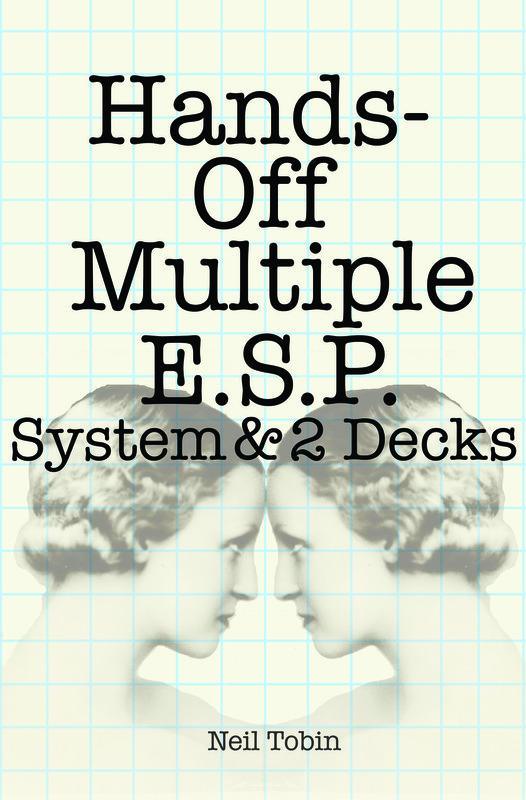 This is the best ESP Deck you can get. I can tell you now that I have these cards in my hands, they are awesome. Hard to explain, but the markings are so much more deceptive in real life than on a video. How that works I do not know. What I do know is that the cards are great, fan great, work great, and look terrific. The markings are deceptive and unassuming. Nobody will notice them even if they look. Reading them is a breeze. One glance and you know. The one way marks are ingenious. All in all, I think I may have finally found the perfect ESP Cards. Well done Neil!! Finally I have ESP cards that don't look like playing cards! They have a different feel from Bicycle cards but are still easy to handle and deal. The markings are very cleverly hidden in plain sight--it will fly right by spectators (I couldn't spot them at all without reading the instructions). You get 2 decks (one black, the other colored) plus some gaffs thrown in. A great buy! It is possible to "read" each card without using my glasses. Neil´s ESP system is undetectable and my favorite. Well priced based on what you receive. So, I five 5 stars. Remember when we visited that paranormal research lab back in the 1970s? And we watched those test subjects with the cards, how they knew what was on the front of the cards when all they saw was the back of them? It was amazing, they must have been - what do you call it? That's right, 'clairvoyant'. Well, guess what? The paranormal research lab closed down, and someone must have salvaged all their equipment, because these are the cards! Seriously, the ones used in the experiments. I bought some. I don't know what it is, but just by glancing at these cards, I can tell what's on the front. Weird, right? And here's something even weirder - some are in colour, and I can tell what colour they are!